Ghost of the Mountain - Snow Leopard !!! Returned from another exotic expedition for Snow Leopard in winter Ladakh,Himalaya. A lot of mental and physical preparation had been done from the past 5/6 months for the preparation of this trip. Cold weather ( -17/-18 deg C even in daytime-sunlight) and high altitude 13,5000ft+ made an entire different ball game altogether. Rather than an usual expedition, I would consider this as an unique experience for my wildlife journey. Was fortunate to get few sightings of the almighty. Along with the Snow Leopard, was lucky to observe & photograph few high altitude Himalayan species which I will upload later. Here is one frame of the efficient rock climber. The distance was far but the moment was memorable. High resolution version is in HomeSlider of my website. How wonderful to see a wild snow leopard in its natural habitat, Arindam! These rare and extremely elusive cats are so beautiful - my heart would be pounding. A fine image showing how they travel across their difficult and precarious terrain. Well done! Great to see this wonderful animal in its habitat! Your time and prep were well rewarded. 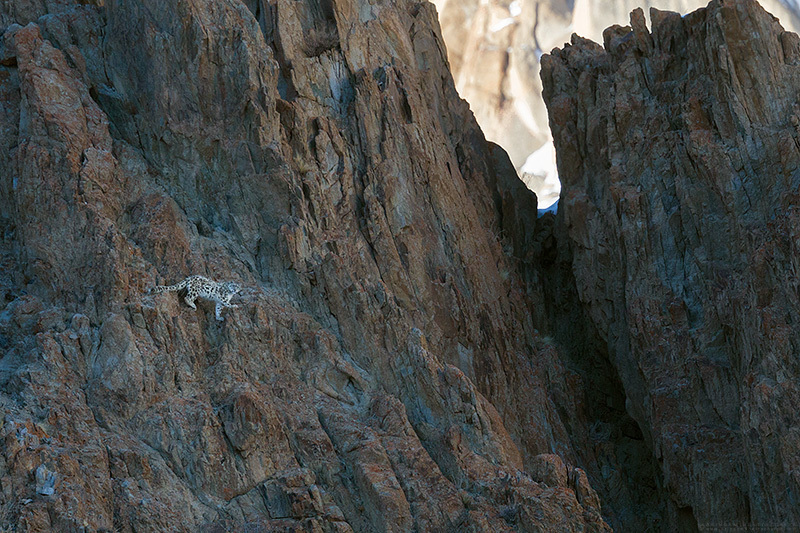 Congratulations on this wonderful photograph of the Snow Leopard. All of your preparations for this expedition paid off. How amazing to have seen a Snow Leopard in the wild and actually captured a photo in it's natural habitat. Enjoyed seeing the larger version with better facial expression. Congratulations on such a wonderful find. what a fabulous sighting. brilliant animalscape. a treat! The landscape is rather surreal and the exotic leopard adds to the wonder. Amazing experience I am sure. This would be the image of a lifetime for me. So glad I came upon it. So hard to find, people spend years trying to see one, let alone get a photograph.